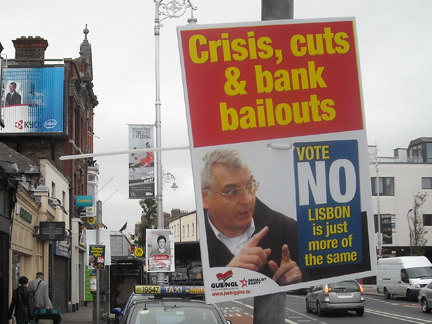 The economy is at the forefront of voters’ minds as they vote in the referendum on the controversial Lisbon treaty. Unemployment in Ireland is at almost 13 per cent or nearly 500,000 people. While Gross Domestic Product or growth, is down just over seven per cent on the same period last year. The main political parties – Fianna Fáil, Fine Gael, Labour and the Greens, are all using the economy as a platform from which to encourage the Irish electorate to vote yes. Enda Kenny, leader of the opposition, told RFI that “Brussels has propped up our economy”. And he believes that Irish voters must vote Yes if they want to end the recession. “What is clear is that industry and people who employ workers in this country have said, ‘If you send out the wrong message on Friday, it’s a message that might lead to other investors in our country investing in different countries’,” Kenny says. The Labour Party, which has 20 TDs (members of parliament) agrees. “Partly because Ireland depends so strongly for foreign direct investment – 300,000 people are employed in multinational businesses here in Ireland, that’s a lot of people, and a very large percentage of our exports comes from that sector,” says Joe Costello, who is the party’s spokesperson on Europe. “Multinational companies looking at Ireland, that will have voted twice in the space of 15 months for a rejection of a treaty that all the other member states are fully in favour of, will certainly make multinational companies think twice, in the long-term, before investing more plant, machinery and money in Ireland,” he adds. Businessmen are also pushing for a Yes vote. They believe Europe is particularly important to a country which exports 80 per cent of its produce, of which 65 per cent goes to European Union member states. “We genuinely believe that because of this damaged reputation, that if we send a positive signal on 2 October it will protect jobs,” Brendan Butler, director of EU and International trade at the Irish Business and Employers Confederation told RFI. “There’s a connection between your international reputation and jobs,” he says. Pablo Vallejo, the director of the Irish bureau of BBVA bank, also believes that Ireland’s business reputation rests of the outcome of the second Lisbon treaty. “I couldn’t say with any certainty that foreign companies would stop investing Ireland or those that are here would leave,” Vallejo says.